FOR SA is appealing the High Court judgment which removed “moderate and reasonable chastisement” as a common law defence that parents could use against a charge of assault. Appealing this case to the Constitutional Court is very costly, because we need to appoint senior counsel and other advocates. Their experience and skill in arguing matters before the Constitutional Court will give our case the best possible chance of success before this Court. We estimate that the costs of this case will be in the region of R1 million Rand, so every donation is necessary and important. Please help FOR SA to represent your interests by making a donation to help cover these legal expenses. FOR SA is a Non-Profit Company (#2014/099286/08) and we are 100% dependent upon voluntary donations. Please complete the form below to make a secure donation via the PayFast website. You can make a donation via Credit Card or Instant EFT. 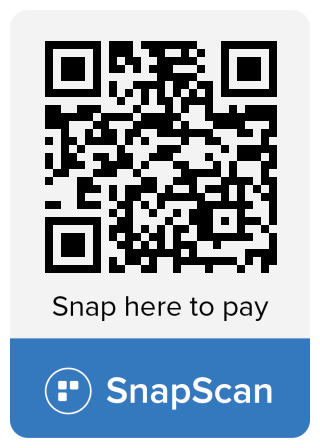 Scan the QR code below with your Snapscan app on your mobile phone. Enter an amount (max R10000 per Snapscan transaction), and tap on Pay.